When you last saw my Mother's Day gift cloche, it was holding pumpkins and apples in one of my first fall vignettes. Today I put my cloche on a cake plate that I have had since the mid 1970's. It had a gold base. I really never use it for cake, so when I saw that the cloche fit on it nicely, I painted the base white. Here is my cake stand and cloche with some faux weedy plant with small purple flowers and my old camera. Isn't this hand clip stand great? I purchased it last week at the consignment shop for $10. It's marked Godinger on the bottom. 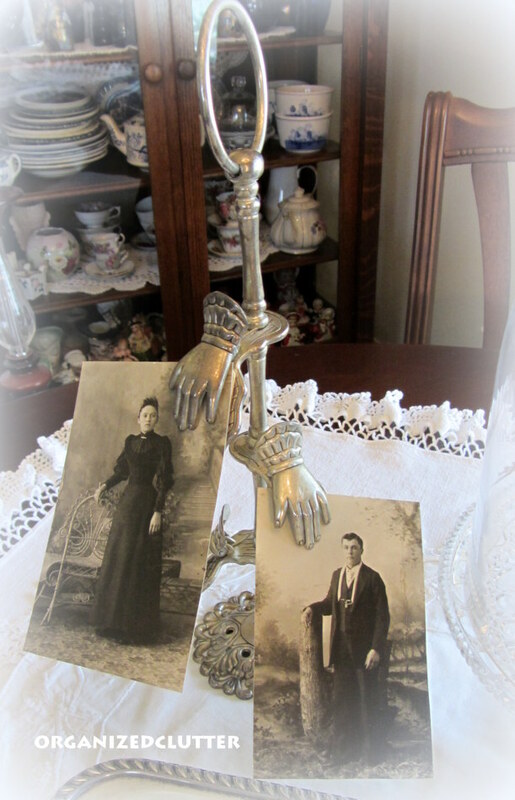 It's a reproduction Victorian hand clip stand. They are selling them on Etsy for quite a bit more. This is one of my Great Grandmothers on my Dad's side. And my Great Grandpa. He was born in Norway. Rounding out this vignette is a silver tray with an older Bible and vintage eyeglasses. Decorating with cloches is sooooo fun! Love, love, love this!! The cake stand looks amazing (and now I can keep on the lookout for one and know I can remove the gold). My GG & GG were born in Norway too. Wish I had photos of them. Gorgeous vignette! I just got my first cloche. I love the camera under it. Mine has a furry owl that I need to post. I also took a picture of the other owl and will post them together and let you know so you can see your owl's almost twin. The little weinee dog that I gave Lynn is about an inch long. Yeah, I forgot I collected them, hah. 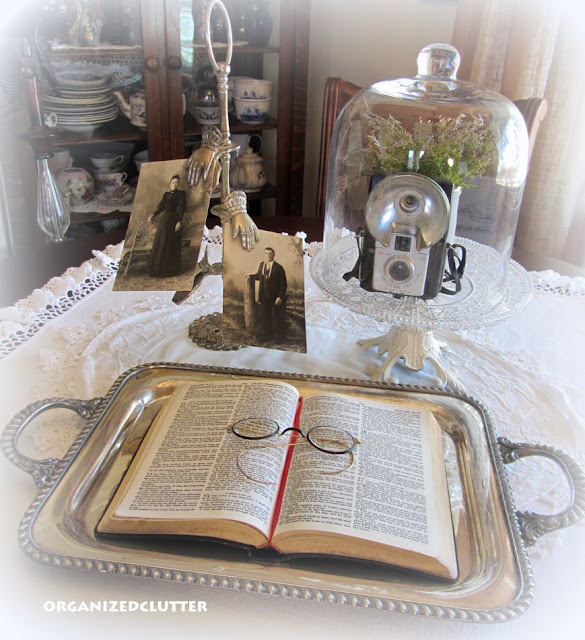 What a pretty vignette - love the fact that the items all have history to them! The Bible on the tray is so nice. Your cloche looks wonderful and it makes such a pretty vignette! The cake stand is beautiful! I love your vignette! Thanks for sharing, Carlene. 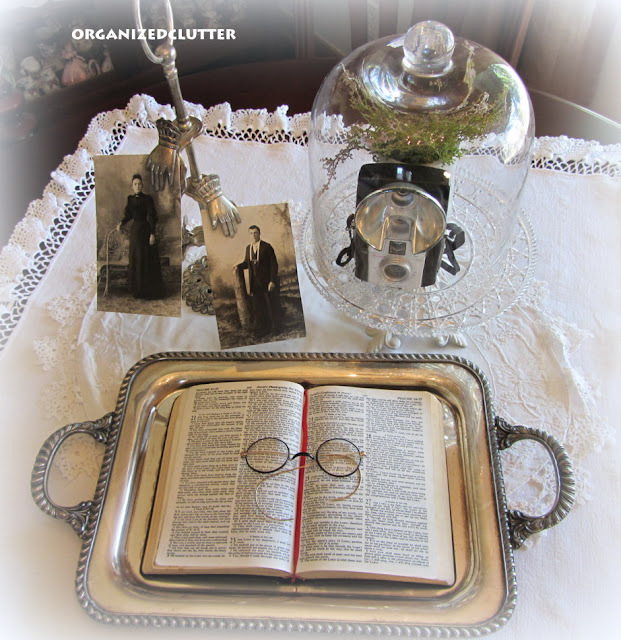 This is a fav of mine...the old pictures, the Bible and the camera....I LOVE it!! Very cute display under the cloche! I love that the cake plate got to be repurposed for using with a cloche! The camera is the cutest idea. Love the whole vignette! The hand clip stand is very cool! Carlene, Your vignette is so awesome. 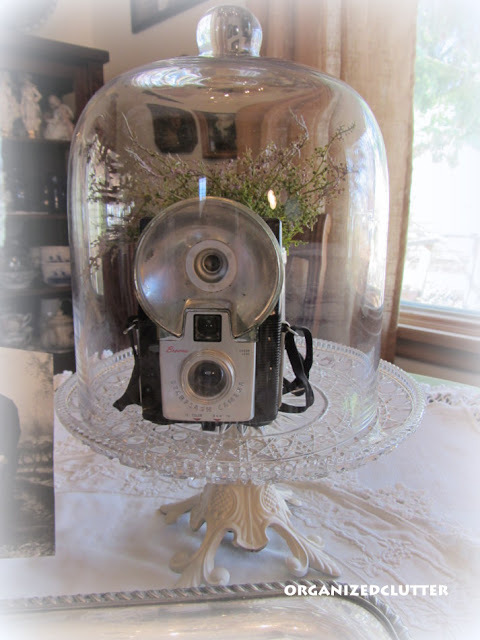 I LOVE the camera under your cloche. Such a great display! I love your camera under your cloche! And adding the old photos and bible pulls the whole thing together. The glasses are the perfect finishing touch! So elegant! I love the old camera under glass. 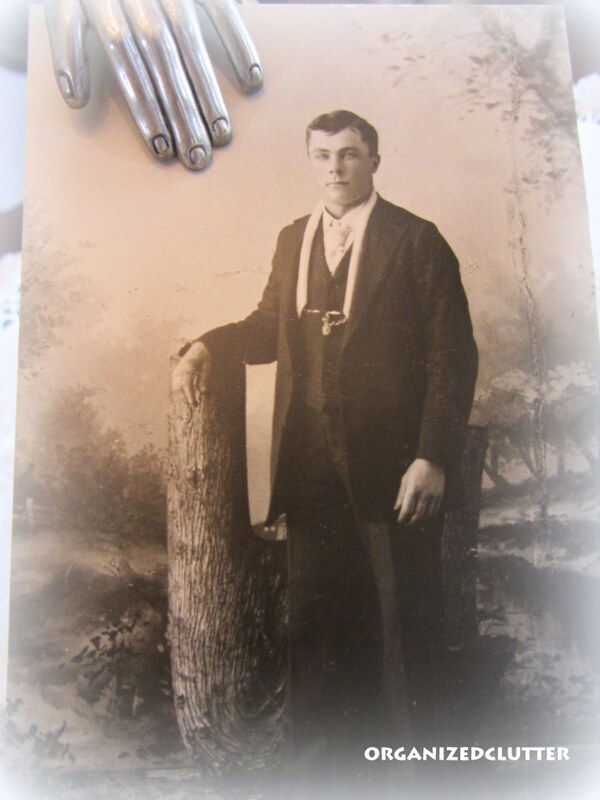 The photos on the hand clip is wonderful. I love your charming vignette, Carlene! Love how you painted the base white, too, made everything come together so beautifully! Thanks for stopping by! Carlene, I love your vintage vignette! I have been picking up a few old cameras. Love yours under the cloche. the hand clip is fab. I have never seen anything like it. The old family photos are priceless! Okay, that's just so cool. Putting the camera under the cloche is genius and that hand clip is amazing! 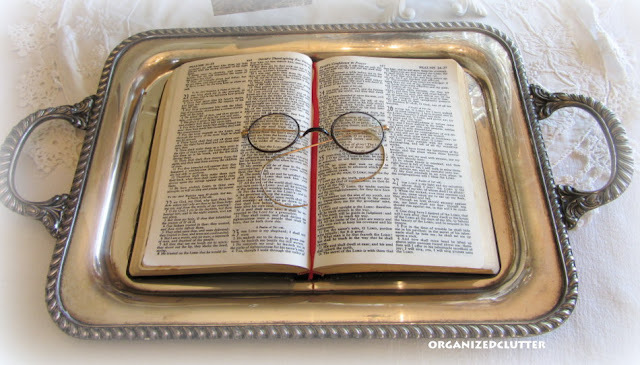 Then you have the Bible on the tray with the glasses? I just love it! You are a never-ending source of good ideas! I love the hand stand holding the pics! Very nice vignette. I am cloche challenged, I can never get it right! I read your comment about a Northern Bloggers Conference on Cottage at the Crossroads. I don't see where you are from in your profile. A few of us from the NY, NJ. CT area have been talking about a meet up. There aren't that many of us it seems. Just beautiful with the old pictures and the camera. What a beautiful vignette, Charlene! You were so clever to put your cloche on a glass cake stand. But what takes my breath away is your old bible and vintage glasses on the silver tray. It tells such a story!!! Hi again. I just posted my owl that looks like yours. Make sure and go to Sue's blog to see her unusual cloche. 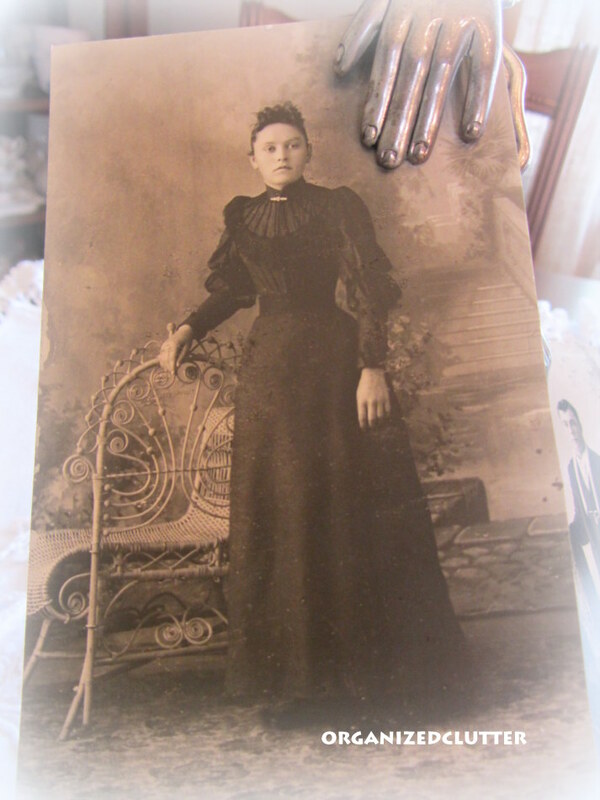 Oh sweet Carline, I'm loving your cloche with the vintage camera and vintage things, along with your g'granma's pic..she's so pretty. The open book looks great too. Thank you for your sweet and kind visit.